VAP (Volume At Price) shows how much of something was traded at a particular price level. These create powerful levels of support and resistance. Identifying these zones is a key to avoiding stops getting hit. They’re also useful in identifying places to go short – or to tag along for a long. There are two ways to analyze aggregate volume on a chart. VPA ( Volume Price Analysis) and VAP ( Volume At Price Analysis). Traditional VPA displays the gross volume traded at a particular time frame via a vertical histogram. The second approach, VAP, is often labeled as a Volume Profile. Depending on how the data is compiled, Volume-At-Price is calculated per tick or is merely a representation of the number of bars/candlesticks that are present at a particular price range. This tool has evolved over the years to include more advanced forms of the Volume Profile such as the Market Profile (Time-Price-Opportunity) – not available on Tradingview, but it is available on MotiveWave. Regardless of the type of VAP used, the principle theory is the same. 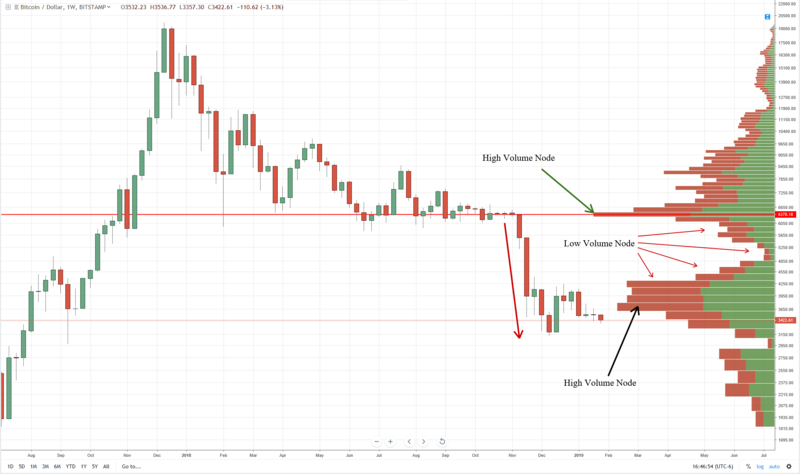 There are two main things I look for in a Volume Profile, and that’s what is called High Volume Nodes and Low Volume Nodes. High Volume Nodes show horizontal ‘peaks’ and stick out – they show that a significant amount of trading has occurred at that price level. Low Volume Nodes are areas where there is little to no horizontal bar. The theory and way that this analysis is used for trading is that High Volume Nodes represent a sort of equilibrium. It’s a strong area of support and/or resistance. What happens when, for example, prices were to fall below a High Volume Node? Well, let’s look. 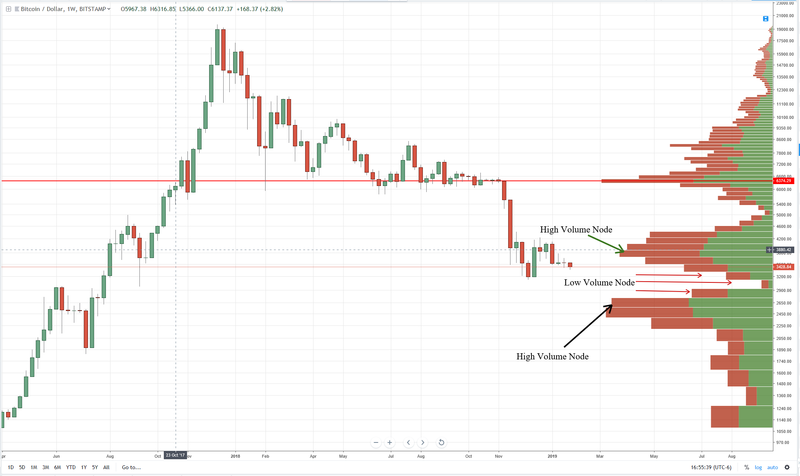 If we look at the chart above, we can see all of the price action where Bitcoin has ever traded between the $2000 value area all the way to the $20,000 value area. The red horizontal line that goes across the screen at 6378.18 is the VPOC or the Volume Point of Control. This is where the most volume of Bitcoin has traded at a price level. Notice the length of the bar on the volume profile. But also notice the low volume node below it. What happened when price fell into that zone? Price collapsed. Empty spaces (Low Volume Nodes) behave like a vacuum. When price enters that area, there’s nothing to support the price action – it’s very empty so price can just blast through a Low Volume Node. And that’s exactly what happened. But if look out a little further, there’s another drop right ahead. At the of writing this article, Bitcoin was trading at the 3426.61 value area. It’s just a hair above 3215.15 – any move below that puts Bitcoin into a Low Volume Node. Prices would more than likely just collapse through that zone until it finds support. Where would support be found? At the next High Volume Node. Which is between 2600 and 2800. 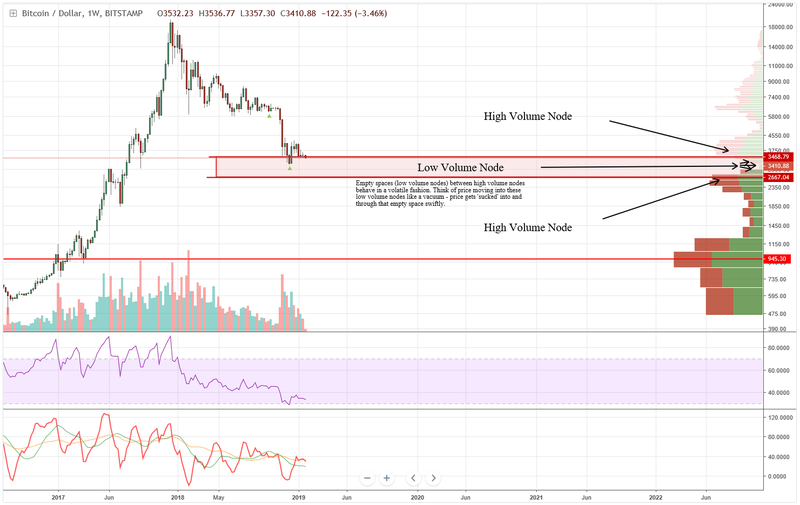 If we think of Low Volume Nodes like a ‘gap’ then we often like to see prices fill these zones – they turn into very strong support later on and they kind of build up a strong foundation for the future. But is there another node like that after 2600? Yes. And that move would see Bitcoin drop from 2500 all the way down to 1105 – a significant and powerful drop that would indicate capitulation has already occurred or is very nearly complete.